Start at the easy-to-spot giant Chinese fishing nets—the teak wood and bamboo food sources that have become Kochi's calling card. Head over to the Vasco da Gama Square around sunset for a picturesque view of the nets on the shore and Fort Kochi beach. You can even grab a fresh fish from the evening catch at a market close by. If you’re in the mood to shop, check out the locally made trinkets, from pretty modern Rajasthan necklaces to Indian clothes, knick-knacks and even hand painted silk drawings. Don't forget to bargain. Oceanos is home to pleasant authenticity and palpable good vibes. Home-style dishes are always fresh and served with a smile. Fish is the signature dish in Kochi, so order the thali (pictured) and you’ll be served a delicious red curry fish that satisfies all taste buds. Broadway may not be as cute as historic Princess Street, but it’s where you’ll find the best bargains at bookstores, spice shops and sari stands. For set prices, check out chain stores like Kalani. However, if you like bargaining, go to the more fun Convent and Market Roads. After shopping, walk over to the Kadavumbagam Synagogue hidden behind a fish shop; while it isn’t currently in use, a nearby shop owner who’s happy to give tours lovingly maintains the temple. This authentic, Ayurvedic “hospital”—as they are called in India—is no frills, has no inflated pricing, and is walk-in friendly. Visit for abhyanga (an oil body massage) and add a steam to rejuvenate your tired, traveling bones. If you need it, book a full panchakarma (detox) treatment. You can also get your body type, or dosha, reading from the doctor on call. This picture depicts a typical Ayurvedic experience. Kochi has a very small Jewish population. While the majority live in Ernakulam and greater Kochi, six of these residents are “Paradesi”—foreign—and live in Jew Town, Mattancherry. The beautiful Paradesi Synagogue, built in 1568, is the only functioning synagogue in Kerala. While it may look plain from the outside, the holy floors are lined with Chinese tiles and the ceilings are studded with chandelier lamps from Belgium. Feel free to visit throughout the week, although Paradesi does close for Jewish holidays and Fridays and Saturdays for Shabbat. Synagogue Lane is lined with shops featuring antiques, tchotchkes, clothes, and Judaica. Stop at Sarah’s Handmade Embroidery Shoppe for challah covers, yarmulkes, and mezuzot. Kashi Art Gallery on Burgar Street has been around since 1997 and doubles as a cafe and a gallery for local art. Local hipsters and tourists sip amazing Keralan coffee over brunch of beautifully arranged Western dishes, like cheese omelettes and homemade breads. Kashi is also a part of the International Kochi-Muziris Biennale, which brings big name artists from around the world to celebrate the city. The warm sand and clear blue ocean of Cherai Beach on Kochi’s Vypin Island feels like a mini-version an iconic Goa beach. Opt to stay with a local family to get the closest views of the portrait-like sunsets on the rocks each night, or stay in a luxury room right on the water. Simply ask around to find yoga, often offered free on the beach. Visitors describe the beach as peaceful, full of locals, and one of the cleanest in Kerala. A gift from Portugal presented to the Raja of Kochi in 1555, the Mattancherry Palace is an elegant white structure with multiple wings and a central courtyard. The rulers of Kochi used the palace as their Royal House and they conducted important ceremonies related to the coronation here. The palace is now home to Hindu murals, depicting scenes from the Ramayana, Mahabharata and Puranic legends in intricate detail (pictured). Kathakali (pictured) is an ancient dance conveying Hindu parables and local legends that still thrives today. Catch a nightly show in Kochi at Kerala Kathakali Centre, which offers a dinner-and-a-show package for only $29 (and even includes a bus shuttle to and from your hotel). Make sure to head over early in order to see how performers apply their make-up and the meaning behind the hand and eye movements of the dance. 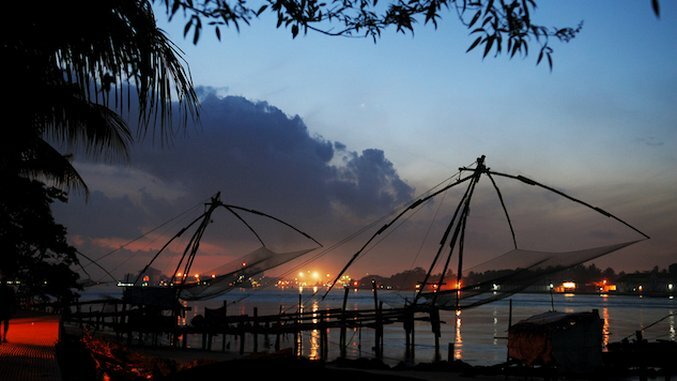 Kochi (or Cochin) is a port city by the Arabian Sea in the tropical, lush, green Indian state of Kerala. It’s a metropolis made up of islands, peninsulas and the mainland Ernakulam—the pulsing shopping center where malls and movie theaters abound. Alyssa Pinsker is a writer and performer working on a travel memoir called Girl Gone Global. She has lived in France, Japan, Switzerland, India and of course, New York City. Her favorite place so far is Kochi, India. You can read more on her website.